Proposing to remove the mandatory 10-year minimum sentence for those convicted of drug crimes, one delegate came under fire on the House floor for putting his faith in the court system. Under HB 121, judges will no longer impose minimum sentences, but be given a maximum cap on the amount of years dished out: 20 years for first-time offenders. Sentences would be left to the judge’s discretion, which could be “something as low as probation or something as high as a maximum of 40-years,” said the bill’s sponsor, Del. Curt Anderson, D-Baltimore City. While Anderson was willing to trust judges’ discretion in serving out sentences, many legislators were not. “Do you feel like this is a bad time to do this?” asked Del. Matt Morgan, R-St. Mary’s. With the heroin epidemic plaguing Maryland, Morgan believes the title of the bill, “Drug-Related Offenses – Repeal of Mandatory Minimum Sentences,” sends the wrong message. “It seems throughout this session we’ve passed numerous bills on the heroin epidemic and trying to resolve that,” said Morgan, asking how this bill intends to help. Since the bill’s introduction to the Judiciary Committee, Anderson has removed manufacturers of drugs from the bill in an attempt to meet legislators halfway. Now manufacturers along with “kingpins,” someone who organizes, finances and supervises a drug operation, will still be subject to minimum sentencing. “We’re keeping the mandatory minimums in place for the most egregious drug dealers,” said Anderson. Del. Patrick McDonough, R-Baltimore and Harford County, brought up the divided 12-8 vote in the Judiciary committee. “States attorneys have discretion…we can accomplish everything you’re talking about through plea bargains,” said McDonough. Anderson understands the power of plea bargains, but even with plea bargains the minimum sentence is still used against offenders. Subsequent offender penalties are used by the state to seek double the penalty an offender is charged with. “Second time offenders are faced with subsequent offender notices, which would more than double their sentence,” said Anderson. Under the bill, first time offenders will no longer have the minimum charge of 10-years, therefore they are less likely to face a doubling penalty of 20-years. Del. 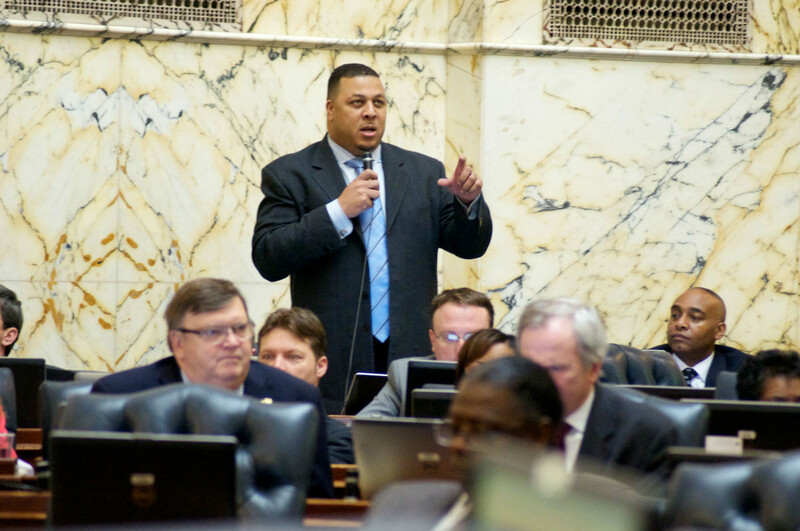 Jay Walker, D-Prince George’s County, was concerned over opposition to the bill by the Maryland State Attorneys’ Association and the Maryland Sheriff’s Association. “These are the folks who are fighting crime on a regular basis…so I’m wondering what consideration you’re giving to those in law enforcement,” said Walker. Walker offered an amendment to the bill, striking out the repeal to third and fourth time offenders. “On the third time caught dealing drugs to our citizens here in the state of Maryland, they will have to pay the punishment,” said Walker. Originally the bill would strike the 25-year minimum for third time offenders and 40-year minimum for fourth time offenders. Anderson thanked Walker for the amendment, accepting it onto the bill in a compromise. If the bill passes, now with the added amendment, the maximum year sentences would be 20 years for a second time offender. Those supporting the bill in the Judiciary committee include the NAACP, the Maryland State Bar Association and Maryland Criminal Defense Attorneys’ Association.